On April 11 and 12, the 1st game of 64th Meijin-sen between Meijin Moriuchi and Challenger Tanigawa(9dan) was held in Nagasaki Prefecture, Japan. 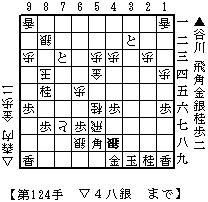 As a result of Furigoma, Tanigawa made a first move(lower side of the diagram). Moriuchi won the game with 124 moves. It was a very exciting game. Tanigawa attacked without making a Kakoi(castle) and his king stayed on the original square until Moriuchi's counterattack threatened it in the endgame. Do you think it was a good example of a famous shogi proverb 'Igyoku wa Sakeyo(Avoid a Sitting King)'? I don't know. There is another proverb such as 'Meijin ni Joseki Nashi(Meijin is free from standard sequences)'. The left diagram is at Tanigawa's resgination when Moriuchi dropped his Silver on 4h supported by the kNight on 5f.